For as long as I can remember people have been creating Linux distributions with a view to emulating the look and feel of other operating systems such as Windows and OSX. For instance there used to be an Linux distribution called Lindows which obviously attempted to emulate Windows and more recently Zorin OS has produced a desktop that looks and feels like Windows 2000, Windows 7 and OSX. Zorin isn't the only distribution that has attempted to mimic the Mac look and feel. The ill-fated Pear Linux suddenly disappeared one day after obviously doing too good a job at emulating Apple's pride and joy. ElementaryOS continues to do its best to look like OSX. It could be argued that Linux Mint hasn't done much too stray from the traditional Windows look and feel and lightweight distributions such as Lubuntu don't look too much different from Windows of ye olden days. Chromixium has been designed to provide a ChromeOS style distribution for a non-Chromebooks. Chromixium isn't the first distribution to try and emulate ChromeOS. I wrote an article back in March of 2014 showing how easy it is to make Peppermint OS look and feel like a Chromebook. The Chromixium developers have really gone for it though. Just look at the screenshot which accompanies this page. Google could easily sue somebody. This review looks at the Chromixium distribution and highlights the good and bad of it. "Chromixium combines the elegant simplicity of the Chromebook with the flexibility and stability of Ubuntu’s Long Term Support release. Chromixium puts the web front and center of the user experience. Web and Chrome apps work straight out of the browser to connect you to all your personal, work and education networks. Sign into Chromium to sync all your apps and bookmarks. When you are offline or when you need more power, you can install any number of applications for work or play, including LibreOffice, Skype, Steam and a whole lot more. Security updates are installed seamlessly and effortlessly in the background and will be supplied until 2019. You can install Chromixium in place of any existing operating system, or alongside Windows or Linux." The above statement can be found on the Chromixium website. There is no doubt that Chromebooks have become a huge success. People can browse their favourite sites and use Google's tools for document creation without worrying about malware and viruses. One drawback to using a Chromebook however is that sometimes you want to be able to install and use a particular piece of software. A good example of this is Steam. The hardware for most Chromebooks is suitable for casual gaming but the Steam platform is unavailable to Chromebook users. There is of course the workaround of dual booting Linux with ChromeOS or using a tool called Crouton to run Ubuntu and ChromeOS side by side. I have written a guide showing how to install Ubuntu on a Chromebook using Crouton and this makes up just one of the "76 Everyday Linux User Guides For Beginners". Chromixium is potentially a better solution however as it provides all of the features of ChromeOS with a very similar look and feel (and I mean very similar) yet also has all of the Ubuntu goodness. You can read all about Chromixium by visiting this page. Chromixium is based on a custom 32-bit Ubuntu 14.04 build. There are two really key points to consider with regards to the above information. The first is that Chromixium is built on top of Ubuntu 14.04 which is a long term support release and so you are supported for many years to come. The other point to consider is that it is 32-bit only. This is a shame because most of the computers released in the past 5 years are 64-bit. It also causes issues if you want to install on a UEFI based computer as you need to switch to legacy mode in order to install 32-bit Ubuntu. I have written a step by step installation guide to help you install Chromixium. If you prefer to be guided by videos there are good links on the Chromixium Guides page. This has to be the easiest look and feel section that I have ever had to write. 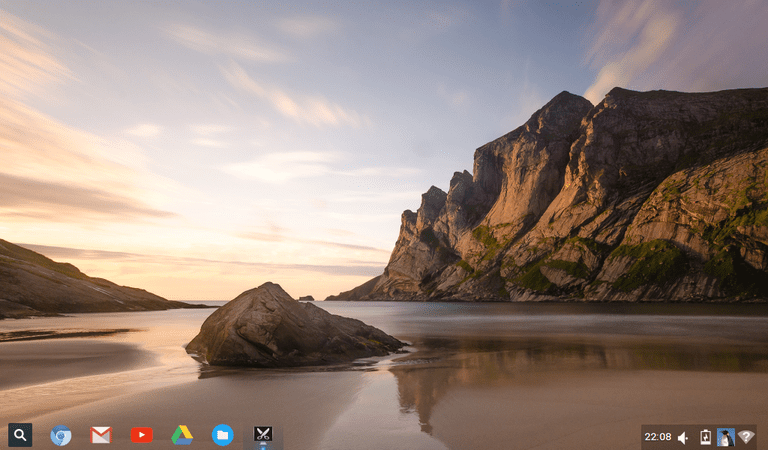 The desktop looks completely and utterly akin to ChromeOS. I am very impressed with the level of detail that has gone into making it work this way. First of all the desktop wallpaper looks great. On top of that the menu works in the same way as ChromeOS and there are even the same icons for Google Docs, Youtube, Google Drive and the Web Store. The only icon that differs is for Chromium which is of course just plain old Chrome on a real Chromebook. The icons at the bottom differ slightly but on the whole the developers have caught the essence of what makes ChromeOS good. There is a slight annoyance that the super key (Windows key) on the keyboard brings up the Openbox menu rather than the menu associated with the icon on the desktop. All you have to do to connect to the internet is click on the network icon in the bottom right corner and select your wireless network (unless you are using a wired connection in which case you will automatically be connected). If there is a password required to connect to the network you will be required to enter it. Chromixium comes with the Pepperflash plugin installed which enables Flash to work in the browser. Other than the File manager and Chromium there are no other desktop applications installed within Chromixium. Actually that isn't entirely true because there are system utilities such as screenshot tools and disk managers and the control panel. If you click on the menu you will see links to Google Docs. This isn't a desktop application, it is a web application. The same is true of Youtube and GMail. Obviously if you aren't connected to the internet this renders your computer next to useless. The whole point of a Chromebook (or in this case a Clonebook) is about utilising web tools over traditional desktop applications. To install online applications click on the menu and choose the web store. You can now search Google's Web Store for the type of application you require. Obvious choices are audio applications and the returned results include things like Spotify. Some surprising results include web versions of GIMP and LibreOffice. You can filter the results by Apps, Extensions and Themes and you can further filter results by features such as whether it runs offline, it is by Google, it is free, available for Android and works with Google Drive. If you are using Chrome to view this article you can search the web store now by visiting https://chrome.google.com/webstore. You can of course install fully fledged applications such as LibreOffice, Rhythmbox and Steam as Chromixium is based on Ubuntu and you are therefore given full access to the Ubuntu repositories. The tool that Chromixium provides for installing applications is Synaptic which is actually a very good choice.as it is lightweight, fully featured and isn't the Ubuntu Software Centre which I have a somewhat love/hate relationship with. If you need to set up printers, connect to remote servers or adjust display settings you can use the Ubuntu Control Panel. I installed Chromixium on my Acer Aspire One netbook as it is the perfect solution for a low end device. I had a couple of minor issues with Chromixium. During the installation a message appeared stating that it could not install the operating system to the hard drive because the hard drive was in use. It was the partitioning tool that was using the hard drive. It worked perfectly on the second attempt. This one might be to do with the fact that I was using such a low end netbook but the menu took up to 5 seconds to display. Sometimes it would load instantly, other times it took a while. This is only version 1.0 of Chromixium but I have to say I was very impressed with the level of detail that has gone into it. Chromixium is great if you spend most of your computing time on the web as opposed to using standard desktop applications. There are so many great web applications nowadays that you could easily get away without using standard desktop applications. For home use Google Docs is a great replacement office tool. If you require desktop applications then Chromixium gives you the ability to install whatever you need. In some ways this is better than ChromeOS. The one instant improvement that can be made to Chromixium is for the developers to release a 64-bit version. Which Linux Browsers Are the Best and Worst?